Towering red rocks illuminate the sunset sky; forest trees encompass the desert sands. To the side of the road, cacti emerge and just down the hill, water splashes against the banks. It may be hard to imagine such a tranquil and scenic area in the desert state of Arizona, but as you travel north, you will find some of the state’s finest-hidden treasures. Sedona, Arizona is the perfect tourism destination for any traveler whether you are interested in outdoor activities, exploring attractions, sight seeing, or just wanting a relaxing weekend getaway. Sedona is also the perfect base to some of the best attractions in the country such as: The Grand Canyon, Lake Powell, Flagstaff Skiing, and many state and national parks. To accommodate the tourists, Sedona provides high-end resorts and spas, as well as four-star quality hotels, multiple bed and breakfasts, and even cabin rentals right alongside the river. For the avid golfers out there, Sedona is home to some of Arizona’s best golf courses. Nestled against the red-rocks, many courses provide mountain golf conditions, instead of the normal desert flat terrain. The premium course conditions and opulent club houses lead to higher prices, but are said to be some of the best courses in the state of Arizona and worth the extra cost to play. Sedona golf is perfect all year round, with an average temperature of 75 degrees and nice-fresh mountain air. Sedona is home to three majorly known country clubs: The Oakcreek Country Club, Sedona Golf Resort, and Canyon Mesa Country Club. Father and son team Robert Trent Jones Sr. and Robert Trent Jones Jr., designed Sedona’s first golf course, The Oakcreek Country Club back in 1967. Their work is widely known for tree-lined doglegs and strategically placed fairway bunkers. The course is player friendly making each hole “hard to par and easy to bogey” according to Robert Trent Jones Sr. Elevated greens surrounded by greenside bunkers offer plenty of room for error if not careful, but if you play with caution there are plenty of opportunities to recover. The golf course is spread out over 145 acres and includes three lakes that come into play four times throughout the round. Course rates run around $99 for a full 18 holes, $65 for 9 holes, or $79 for the Twilight special (After 1 pm). All rates include the green fee, cart, and range token. 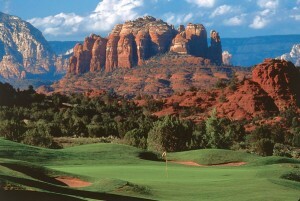 Golf Digest and the Arizona Republic have ranked the Sedona Golf Resort, in the top 5 best public courses in Arizona. The course was designed by Gary Panks in 1988 and is considered to be an unforgettable experience. The par 71, 6,646-yard, course provides a challenge to any player. Like many mountainous courses, Sedona Resort has elevated greens and bounded fairways, making accuracy a must. 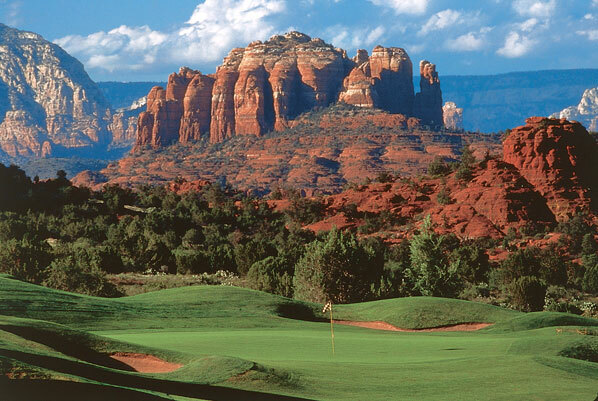 No matter how many times you play Sedona Golf Resort, a new challenge will await each visit. The par 3, number 10 is considered the course’s signature hole due to its tremendous view. The hole is one of the most photographed holes in the western United States. The resort is currently managed by Hilton Hotels, which offers room and golf specials all year round. Aside from golf, the resort also has an award-winning bar and grille. Canyon Mesa Country Club is not your average club and varies from other Sedona courses because it is an executive 9-hole facility. It is an ideal layout for both beginners and advanced players. This unique par-28 course is short in length, each hole averaging 140 yards, but also has challenging-narrow greens, making it a perfect place to work on approach shots. The best part: a round starts at just $16.50 for 9 holes, or $25 to play it twice through. Canyon Mesa Country Club also offers tennis and swimming, which makes it a perfect destination to bring a whole crowd. Sedona has other various outdoor activities to participate in such as: hiking, biking, hot air balloon rides to the Grand Canyon, pink jeep tours, ATV rentals, fishing, and horseback riding. If you are not one for physical sports, enjoy a scenic drive through the splendid rock formations, bird watch, star gaze, or even enjoy a simple picnic alongside the river. Whether you are looking for a quick weekend escape, or wanting to make a week long vacation, Sedona offers plenty of activities to keep guests entertained. Visit the Sedona Chamber of Commerce website to get more information.